Brocade 57-0000075-01 transceiver kopen? | That's IT! Gebruikt, bulk in antistatische verpakking geleverd. 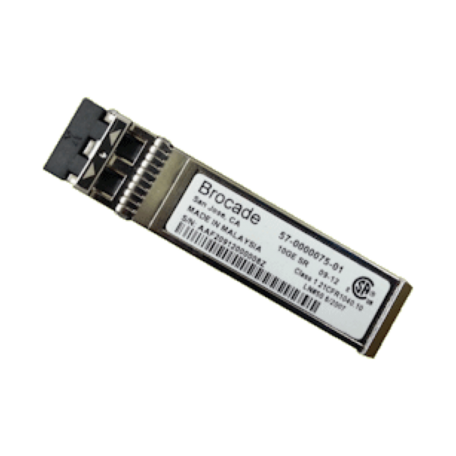 The Brocade 10 Gbps Fibre Channel SWL SFPs are hot-swappable, low-voltage (3.3 V) digital diagnostic optical transceivers that support high-speed serial links over multimode optical fiber at signaling rates up to 10.5 Gbps. They comply with SFP+ mechanical (SFF-8432), optical, and electrical specifications (FC-PI-5) for LC duplex transceivers. The Brocade 10 Gbps Fibre Channel SWL optical transceiver is a multi-rated 850 nm SFP that complies with 10.5 Gbps Fibre Channel specifications.